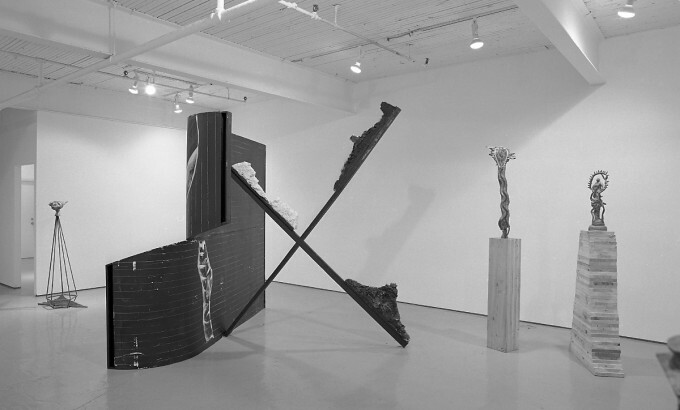 This exhibition by Toronto artist Michael Davey will comprise a large wall, wood and plaster construction as well as twelve cast bronze and lead works. The works on exhibition are based on reflections from drawing, modelling, foundry processes, direct construction and travel. 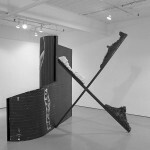 Underlying the making of the sculpture is an emphasis on the structure and ordering of symbols and images referring to projectiles, heads, sickle and hammer, Pickering B, fish, vegetables, tornadoes, reptiles, walls and growth curve. Michael Davey graduated from York University in 1974 and the Edinburgh College of Art in Scotland in 1975. 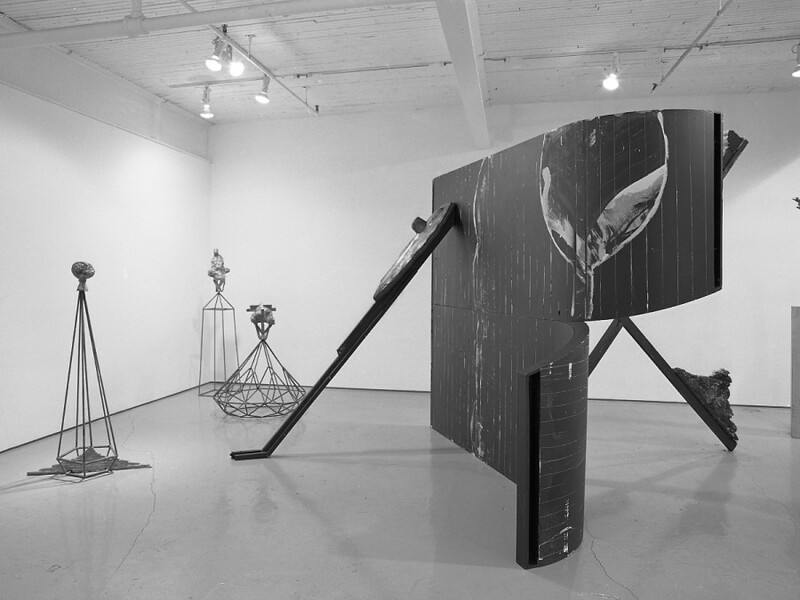 Since 1976 he has participated in group exhibitions in Toronto, New York, and Hartford, Connecticut and solo exhibitions in Edinburgh (1976, 1977, 1978); Toronto (1980, 1982); and Cararra, Italy (1983). 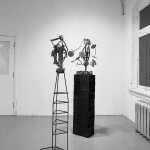 Michael Davey is currently an instructor in sculpture and drawing at York University, Toronto. The imagery skilfully combined in these 13 raw, twisting bronze statues has come from TV and ancient American mythology, alchemy and Tantric art, newspapers and movies and political propaganda. There are rockets, hammer and sickles, strange little episodes (a fish disgorging a man), and salamanders shinnying up bronze poles. Toronto sculptor Michael Davey may be the first artist to realise a depiction of a nuclear power plant in the venerable bronze medium. 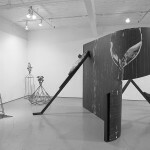 But however disparate they may appear, these sculptural images are all moments in the artist’s long meditation on the relation between the modern and primitive worlds and on the hope that the former may be renewed by contact with the latter. Daveys quest has taken him from Toronto to the remote out backs of South America and back again, and off for long visits to prehistoric sites in Britain and Europe. The works he has made are most usefully understood as notebooks of that mental travelling. They also represent some 13 attempts to unify the widely separated realities Davey has encountered along the way. The best example of this mystical art making is a large, untitled work in bronze and lead, installed on the north wall of the gallery. Below a crucible we find a large lead snake, the ancient symbol of creative and sexual power. Out of the crucible rises a vortex of metal and from the tornado spring a bronze-casting instrument called a gate, a little boat and a salamander (alchemical symbol of transformation). The piece is a succinct summary of the artist’s work as Davey sees it — a work of serviceable design, craftsmanship and finally vision. Michael Davey’s new work, predominantly cast bronze and lead, gives clues to a conscience turned to contemporary political struggle and a perspective that claims ‘primitive’ sculpture as legitimate inheritance and example. Davey recently returned from a trip to Peru where he visited ancient sites and studied artifacts of long-departed cultures. To hear him talk about skilfully mortised stone and agrarian sensitivities borne out in aesthetic play gives one the impression of an artist who would give full credit to the artisanal in the context of present-day practice. The appeal of bronze and lead: their fluency under heat and the raw quality of their surfaces. Davey’s bronze is more frequently a matter of lines than solid mass. 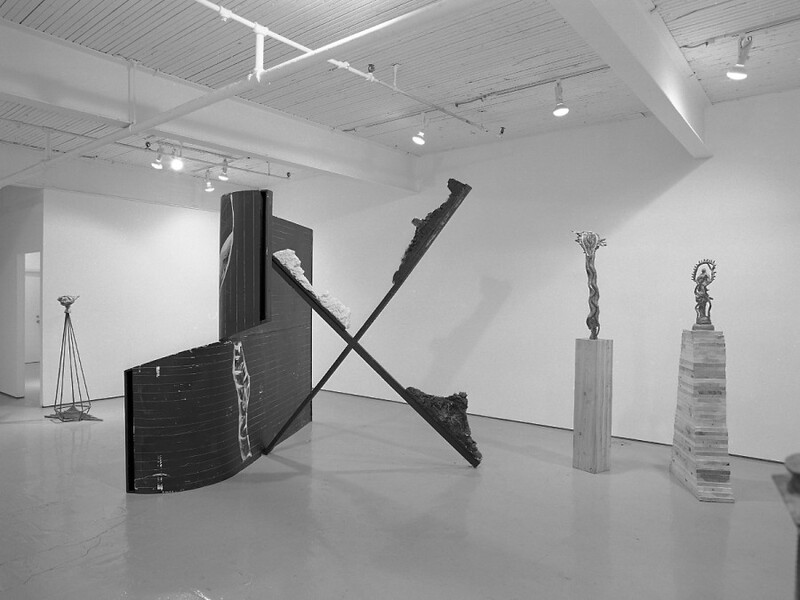 The pieces are more extensively read against open space than as self-contained topologies. One piece combines figures wielding club and gun and shield. (It is often the case that, as here, newspapers supply him with images.) Topping off this work is a hammer evoking sonorous contact of both creative and destructive consequence. Also to be noted is a sickle buried within the play of elements. Davey risks the strong magnetism of previous connotation and through his own intention breaks the attraction. In a second piece a fish disgorges a figure which is both male and female and whose features are wound about with wire. The artist takes as his model what must read to the viewer as a kind of pan-totemism. As sculpture it aspires to the condition of story. Attached to a side of the fish is a turbaned and blindfolded head loosely built after the image of an Afghan prisoner. In order to broaden his range Davey shows himself willing to make the blunt graft. Bronze rods bound by bronze of like thickness brave an association with the Fascist emblem of bundled sticks; the viewer suspicious of such resemblance could just as well see precedent in Manet’s painting of a bunch of asparagus. What is distinctive and what carries the motif beyond possible derivations to its own resolution is a feeling of containment and tautness that suggests the forces of molecular structures. This suggestion is promoted by bases of steel reinforcing rods welded into patterned structures which appeal to us beyond what sense we make of them as supports. It may be that the frequent juxtaposition of such supports with the more plastic features of cast elements call upon our relatively late understanding of nature as intelligible on two levels, one being the subatomic available to us only conceptually and the other beginning where it takes on flesh so to speak and appeals to the senses. Davey encouraged other readings. 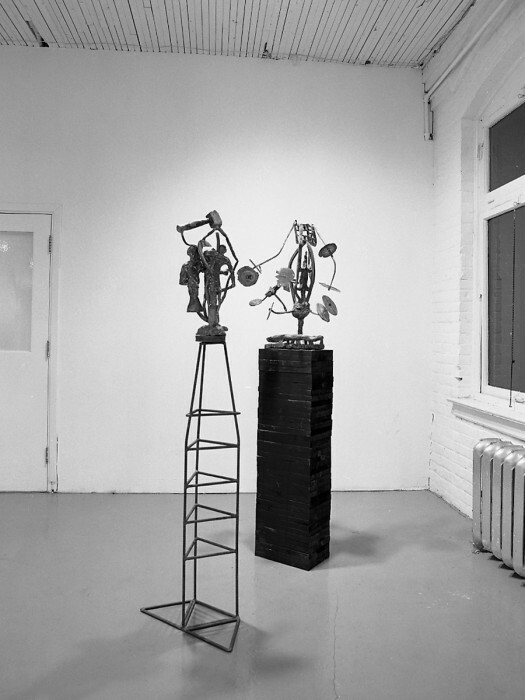 In one instance the rods were meant to suggest a communications tower while the more traditional site for the practice of sculpture – atop some support or other – contained a kinetic shape borrowed from a drawing from Leonardo. In Davey’s treatment the sympathy is such that either he can go back only a century – the element has an industrial revolution feel to it – or that Leonardo kept a prophetic eye turned in the direction of grimy English cities. Davey’s bases are sometimes tall boxes first painted white, then painted black and finally scribed with narrow vertical lines giving the impression that to get to his work you have to go up the front steps of Modernism. Yet, the form of a reptile is found at the centre of some. The artist talks about the feeling of holding such a creature and sensing through his hands the quick, frightened life waiting there. He is mindful of the temporal dimension which the idea of evolution can furnish such moments of contact. Incorporated as part of individual works are pieces of the technology of casting – vented tubes with cup-shaped spouts that often look like rockets. Davie wants us to remember the broad history of malign applications given to metals. The generalized stepped shape of a battleship can also be found within his work. It is against such applications that he applies himself.